Yesterday was one of those days. Not horrible and it certainly could have been worse, but nothing seemed to be going our way. All Harper wanted to do was go swimming. Our next door neighbor has a pool, but they were not home. The rec center did not open until 1:00. We promised her a swim after nap. She even put on her bathing suit before she laid down for her nap in preparation. When she woke up, Mitch went next door and asked if we could come over for a swim. They said "yes" and Mitch said we were going to wait for the sun to come back out. Well, the sun didn't come back out and it started to thunderstorm. Eventually it stopped raining and Mitch set up the little baby pool for them , which seemed to appease them. So I decided to start dinner. I went to the grocery store earlier and we were planning on grilling out. I checked the fridge and could not find the shrimp and fish any where. I checked the fridge in the garage, but no fish. I checked the freezer....no fish. I checked the back on the van and there was still one bag of groceries left in the van. Of course, it contained all the frozen and cold stuff I had purchased earlier. AAARRRRGGGGHHHHH! We had to throw everything away. It had been sitting in my very hot van for at least 7 hours. Mitch headed to the grocery store to replace the spoiled food. I started some rice and put corn on the grill. He got home and turned on the other burners on the grill. He came inside and made kebabs with the shrimp along with some pineapple and mushrooms. When he opened the grill to cook the kebabs, it wasn't hot. Of course, we had used all the propane. So he headed back to the store to get more propane. At this point all we could do was laugh and drink a beer. I am choosing the above shot as my best shot because the photo seemed to fit well with the story and he is just too darn cute. that is a great expression...and really what else can you say when those days happen? hope today's a better one :). Oh, at least you could just sit back and laugh (and have a beer!) - I would have been growling at that point! Today is going to be better, for sure! And I'm so jealous you are getting thunderstorms. I love a good storm and we rarely get a thunderstorm here! I love that wrinkled up nose...and am glad that you could sit back, laugh and drink beer. That sounds perfect for right about now...but I'll wait til my husband gets home. lol!! such a cute expression, it does seem to reflect the day well! Some days, the only good thing to say about them is that they END! Hope today has been a better day. Oh, and YES he's a cutie! Ahhhh this is so frustrating. Glad to hear that you were able to laugh by the end. Glad that at the end you just had to laugh. Somedays you are the bug and somedays you are the windshield, right?? I think it's a triumph when you don't have to wait and look back on it before you laugh. Love the boy's aptly wrinkled nose and his combed curls. Beautiful! I love your solution...have a beer! I have definitely had those types of days. 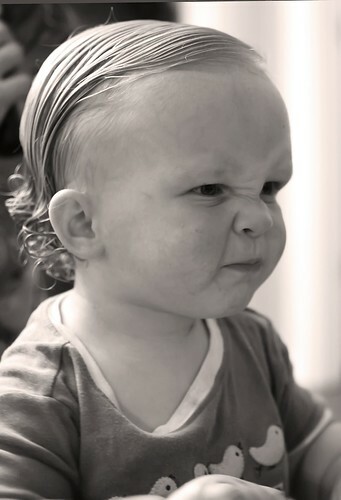 I agree, the little guy is just too cute, I love the scrunchy mad face. That is the perfect facial expression for THOSE days. Hope that you have a much better day to make up for it soon!